A lane in Sonargaon towards Panam (?). 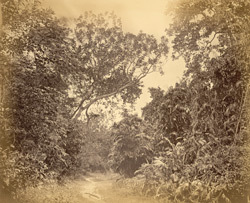 bl.uk > Online Gallery Home	> Online exhibitions	> Asia, Pacific and Africa Collections	> A lane in Sonargaon towards Panam (?). Photograph of a lane in Sonargaon towards Panam. This print was taken by an unknown photographer in the 1870s and is one of a series of 88 albumen prints in an album entitled 'Views in India and Bangladesh', part of the Temple Collection. The view shows a narrow path through a wood near Sonargaon in Bangladesh.